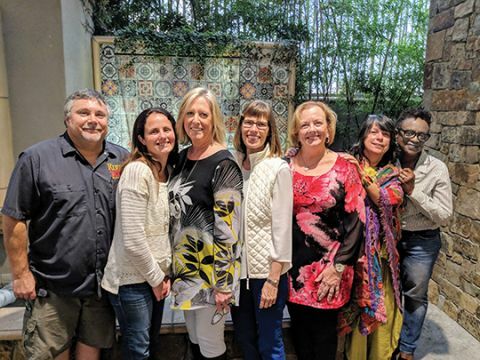 (L-R) River City Brewing Company owners Steve Cuneo and Beth Biro celebrate at the Hops for HOPE fundraiser with Darlene Davis, executive director of HOPE, and HOPE board members Margaux Helm, Susan Armstrong, Ann Leber, and Shannon Dickson. CARMICHAEL, CA (MPG) - The second annual Hops for HOPE fundraiser was held on October 4 at Carmichael’s Milagro Centre, hosted by River City Brewing Company and HOPE. Community donations help support HOPE’s mission to offer affordable counseling sessions to those in need and allows the organization to train new therapists to serve the community. The owners of River City Brewing Company, Steve Cuneo and Beth Biro, are happy to support the mission of HOPE. “We’ve known Darlene [Davis, executive director of HOPE,] a long time. We did HOPE’s fundraising event last year, and we’re happy to do it again. The event brings attention to the Milagro Centre and raises money for an important local cause,” said Cuneo. Davis said that most of the staff members of HOPE weren’t able to attend the event because they were busy in counseling sessions; evenings are prime time because it is more convenient for clients to meet after work. But Davis was happy to see in attendance many prior employees who worked for HOPE during their training and are now licensed therapists in private practice. When Davis asked Margaux Helm to join the board, Helm was already very familiar with the organization and knew that HOPE is an important part of the community because of both the affordable services and the training of future therapists. Helm used to be the director of WEAVE, and “we would need alternate places to refer people, and HOPE offered affordable services.” Helm also taught at California State University Sacramento in the graduate counselor education program and helped coordinate student internships at HOPE. Helm revealed that Davis was recently awarded the Distinguished Clinical Member Award from the California Association of Marriage and Family Therapists. “She’s a great therapist, and a great leader, and she won’t brag about it,” said Helm. Not all attendees were previously familiar with HOPE’s mission. Carmichael locals Peter and Kitti Ruttan bought tickets at the door on the evening of the event. “We saw it in the paper and thought, ‘Well, we can give to a charity and drink beer,’ so we just decided to do it,” said Peter Ruttan. Kitti Ruttan was interested in attending specifically because it was a fundraising event. The Ruttans just recently moved to Carmichael, and Kitti Ruttan said, “After moving to a new community, I think it’s important to get involved and give back to the community.” They are especially cognizant of the necessity for affordable mental health services because both of their children have struggled with mental health issues. Davis thanked everyone in attendance for their support, and commended the donors for their generosity. She also had a special message of thanks for the members of the board, who “have helped grow HOPE to what it is today.” Davis hopes to expand the fundraiser next year with a raffle and live musical entertainment to increase turnout. For more information about HOPE, or to donate directly to the organization, visit their website at www.hope-counselingcenter.org.